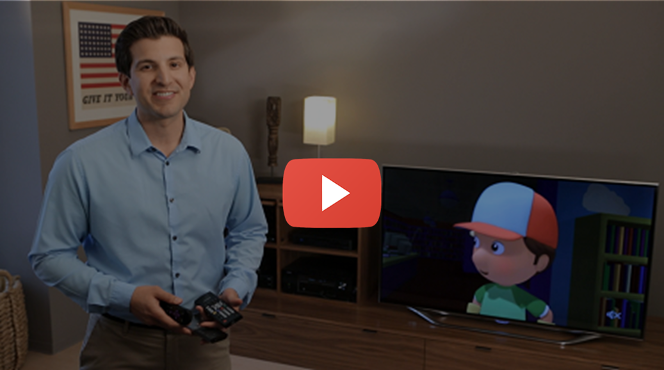 Walk through our setup tutorial: adding your home entertainment devices, setting up one-touch Activities and learning more about the usage of your remote. Already set up and something's not working? Our troubleshooters and support articles will help set things right. Your Harmony 600 allows you merge the remotes of up to 5 of your home entertainment devices into one so you can, and should! keep those other remotes out of sight. The MyHarmony desktop software will guide you through entering the manufacturer and model numbers of your home devices so Harmony understands how to control them. It then helps you create Activities (or scenes) so you're only one-button away from watching television or playing a game. Harmony 600 remote enables one-touch Activity based control of your home entertainment system. Two AA batteries come included with your Harmony 600. 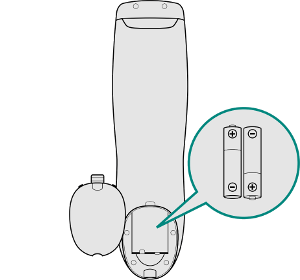 Remove the back battery cover and insert the two AA batteries into the remote. 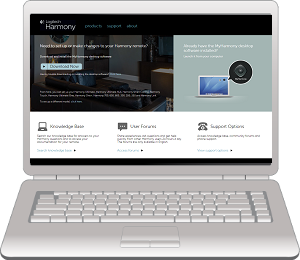 Your new remote is configured by connecting your Harmony 600 to your laptop or desktop computer using the supplied USB cable, and signing in to the MyHarmony desktop software. Download and install the MyHarmony desktop software. If this is your first Harmony remote, create a new account. If you already have a MyHarmony account then you may sign in and add this new remote to your account. Ensure you've installed the two AA batteries into the back of your remote. Using the supplied USB cable connect Harmony 600 to your computer. If this is your first remote then you'll be prompted to enter the manufacturer and model for each of your home entertainment devices. Learn more about finding your device's model number. Are you upgrading an existing Harmony remote? You may also choose to import your previous remote settings. Once all your devices have been entered, the MyHarmony desktop software will prompt you to create Activities such as Watch TV, Listen to Music or Watch a Movie. You'll be asked what input each of your devices have to be on in order for you to see video and hear sound. Follow the on-screen instructions, or learn more about creating a Harmony Activity. That's it! Click the Sync button to transfer these settings to your remote. There are 3 direct Activity buttons, plus a "More" button that will display additional Activities on the remote screen. After creating Activities using the MyHarmony desktop software you can star your entertainment system with these one-touch buttons. Did one of your devices not power on, or switch to the correct input? The Harmony Help feature will ask you a series of questions to bring everything back in sync. Use the 4 side buttons to select items from the LCD screen. You can customize the commands that appear on your screen or even add Favorite Channels. The bottom button toggles between Activity and device mode. It's best to always use your remote in Activity mode so Harmony can keep all your devices in sync. The Harmony 600 buttons are automatically mapped based on the Activity you're in. While watching TV, the channel buttons will control your cable/satellite box. While listening to music, the channel buttons may change radio stations. Want to customize these? Learn more about button mapping. Add up to 23 Favorite Channels to your screen, with icons or station names. Learn more about Adding Favorite Channels. To help keep your Harmony in sync with your devices, avoid turning your television, cable/satellite box and other devices on and off manually or by using their original remote control. If something didn't turn on then use the help feature. The Harmony remote isn't being detected by the computer Did your Activity not turn on correctly, or is a device not being properly controlled? Harmony fails to sync Here are some troubleshooting steps for resolving Harmony remote sync errors. Send additional commands when an Activity starts or stops Harmony allows you to configure additional commands to send when an Activity starts or stops. For example, you may wa..
Changing when a device powers on or off By default, Harmony turns off devices that are not being used as part of the current Activity. Harmony gives you the flexib..